Welcome to third and final part of Spring Dependency Injection tutorial series, in previous article we came across a quick introduction about Spring IOC and Spring DI. Than we came across implementation of Spring DI via constructor method. In this particular blog we will see Spring DI via Getter method in details. 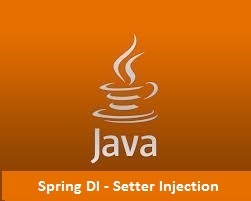 Setter Injection is the most preferable method of Dependency Injection in Spring. Setter based DI is implemented by calling a setter method on your Bean. From the configuration point of view Setter Injection is more easier to understand because the property name being set is used as a attribute to bean along with been being injected. See the example below to better understand Setter Injection on User class. The scenario is that we have two classes, StudentImpl and StudentAddressImpl , each class is implementing an interface Student and StudentAddress respectively. Simple interface with a single method declaration. A simple class implementing Student interface to override getStudentDetails() method. Simple interface with a single method declaration in it. This is the method that we will try to call in StudentImpl class. StudentAddressImpl class is a simple class, to call any of its method we need to create an hard coded object of this class. But in this blog we will call it's methods using a reference of StudentAddress interface. Our objective is to call ?getStudentAddress()? method of StudentAddressImpl class in StudentImpl class without creating a dependency in between these two classes. This this can be done using setter method of spring ioc. First of all we have defined two classes here as a bean, and than we have injected a property named studentAddress as a property of StudentImpl class. Now this property studentAddress will be used as an object of ?StudentAddressImpl? class inside StudentImpl Class. In this particular blog we came across a quick introduction to Spring DI and Spring IOC using Setter Injection method. In next and final part of the series of Spring IOC tutorial we will cover Spring DI via Constructor Method.